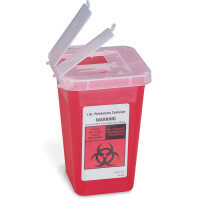 Sharps Disposal Containers / Containers for Disposal of Needles, Sharps, & Syringes: Sharps Boxes, Sharps Bins - Safely dispose of sharps in red containers labeled biohazard waste - one way tops and secure storage, including lockable and wire sharps wall brackets. 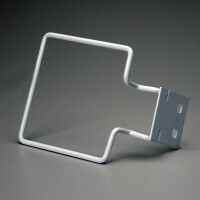 OSHA 29 CFR 1910.1030(d)(4)(iii)(A)(2)(ii), requires that during use, containers for contaminated sharps must be: "[m]aintained upright throughout use. 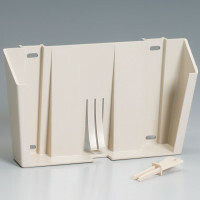 . ." The use of mechanisms to restrain sharps containers is one way of preventing spillage during use; however, the Bloodborne Pathogens Standard does not specify the use of restraining mechanisms for all situations of sharps container use. 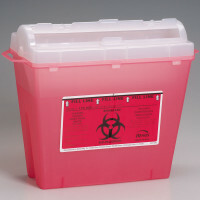 For example, if a workplace assessment reveals that sharps containers can be maintained in an upright position during use with no danger of being knocked over or spilled, or that the containers must remain unrestrained to accommodate mobility needs, or employees or patients might be endangered by fixed sharps containers (e.g., in a mental health or correctional facility), the use of restraining mechanisms would not be mandatory. The placement of sharps containers, as well as the measures used to maintain them in an upright position during use, must be based on the site-specific hazard assessment of the area of intended use.